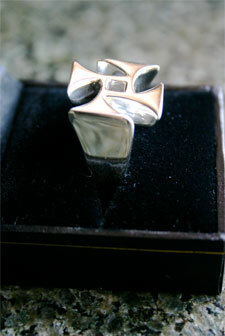 Sterling Silver Process Church Rings are now available in a very limited run in both men’s and women’s versions. The lady’s ring is more petite, and a size 6. The gent’s ring is bigger, fairly heavy, and a size 10. Each can of course be altered by your local jeweler for a better fit. Please be aware that limited production means that there could be as long as a four week wait on your ring order. Price is $175 each for men’s or women’s sizes.